Try these Halloween Party Activities for Kids at your next spooky gathering to ensure all of your costumed guests have a great time! Whether you’re throwing a Halloween party for kids, adults, or both, you’ll find plenty of ideas below. Halloween is a great time and reason to throw a party. It gives the kids another opportunity to wear their costumes and Fall temperatures are usually pretty mild. 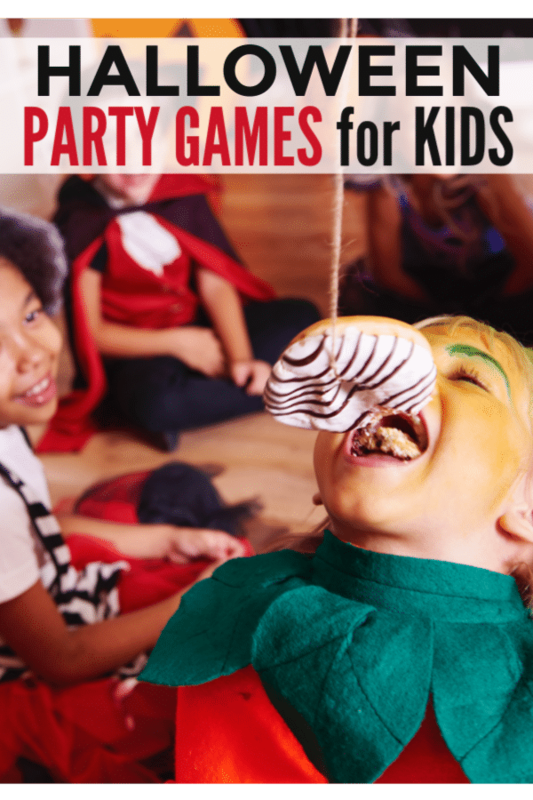 If you love the idea of a Halloween party but are worried about how you’ll keep a large group of sugared-up kids entertained for a couple of hours, don’t worry! I’ve put together this list of simple and fun Halloween party activities for kids, guaranteed to entertain both boys and girls. 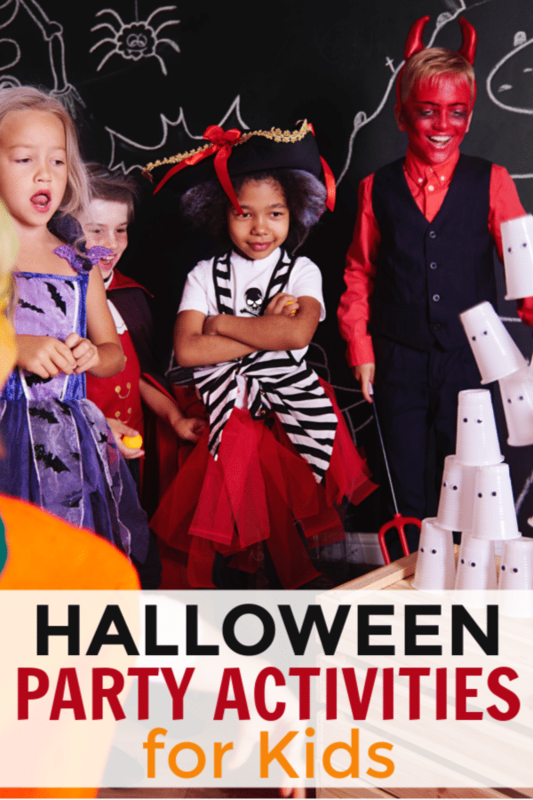 Here are some inexpensive and easy Halloween party activities for kids that can be put together and played with very little effort. Ghost in the graveyard is a great game for a kids’ Halloween party. Kids love it and they burn off plenty of sugar from Halloween candy while playing it. To Play: Choose a player to be the “ghost.” Drape the ghost with a white sheet. Choose a central location, such as a bench or tree, to be the gravestone. Have the ghost count to ten while the other players hide. The rest of the players are called ghost hunters. The objective is for them to reach the gravestone without being tagged by the ghost. If a ghost hunter is tagged, he must freeze in place until another ghost hunter taps him. When all players have been frozen, the last ghost hunter to be tagged becomes the new ghost. This is one of my kids’ favorite Halloween party activities — they play it anytime though, not just at parties! Bobbing for apples is a long-established, classic Halloween and fall activity. Adding a game of bobbing for apples to a Halloween party is a great way to break the ice and get people talking. Throw a few twists into this classic game by dyeing the water red or installing an air pump in the bucket to make it bubble. To Play: Fill the tub with water and add apples. Players take turns trying to retrieve an apple from the tub using only their mouths (hands must stay clasped behind their backs). Time each player. The person who snags an apple in the fastest time wins. Other “bobbing” games can be played as well. Hang a few sugary doughnuts from a doorpost and see who can finish a doughnut the fastest without dropping it to the floor. 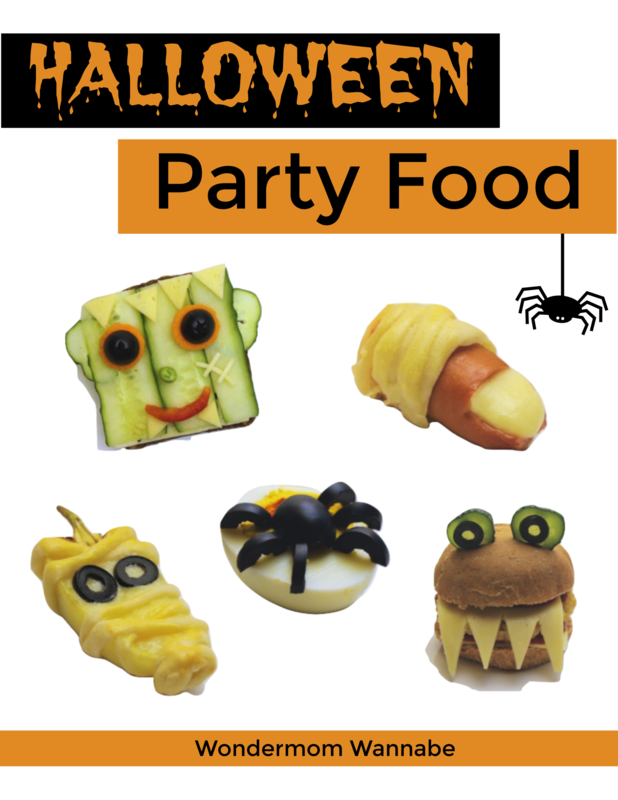 A super easy and fun Halloween party activity is the Freeze Dance game. Kids of all ages can play and after the game, you can continue playing the music to set the tone for the party. To Play: Gather players on the “dance floor” and begin playing Halloween dance music. Choose random moments to pause the music. Any players who don’t “freeze” when the music pauses must leave the dance floor. Continue pausing and unpausing the music until only one dancer remains on the floor. The last dancer on the floor is the winner. 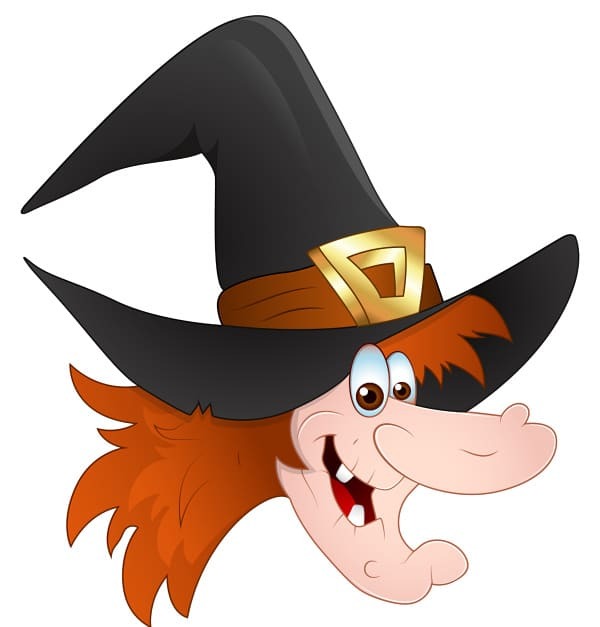 Draw a picture or sketch of a witch (see picture below). The drawing can be simple or complex. Decorate and draw details based on the age of participants. If you want, you can give your witch green skin. Make sure to draw a prominent nose. The picture can be cut out or left drawn and colored on the poster board. To Play: Use a scarf or bandana to cover the eyes of each player when it is their turn. Spin them gently in a circle and have them try to place the wart (a small piece of Play-Doh) on the witch’s face. The person who gets the wart closest to the nose wins. 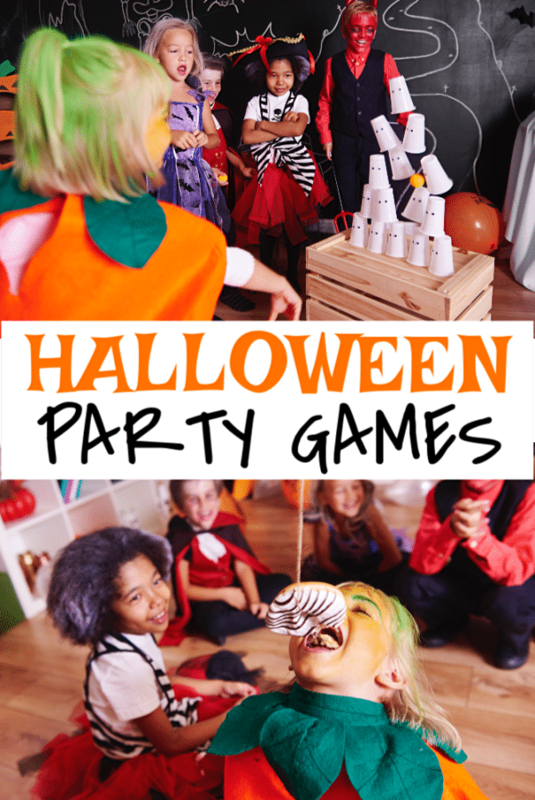 This game is easy and flexible and can be played with items on hand or dressed up with a fancy pumpkin and decorative bean bags. However it is played, Pumpkin Toss is always popular and fun, especially at school parties. To Play: Place a line of masking tape on the floor at a reasonable distance back from the pumpkin. This is where players will stand to toss the candy or bean bags into the pumpkin. Base the distance from the pumpkin on the age of the players. Take a few practice shots before the game begins to make sure the line is placed far enough back to make the game a little challenging, but not impossible nor too easy. Have someone keep score. A tally board on a chalkboard or a piece of paper works well. Allow children to line up and take several shots at the pumpkin, 3-5 attempts per turn. If time permits, let each person take several turns, rotating after each group.